Bob Dylan has canceled an East Asia tour after Chinese officials refused permission to hold concerts, his promoters said. The U.K. Telegraph has reported that the 68-year-old singer was due to tour Beijing, Shanghai, Taiwan, South Korea and Hong Kong this month following concerts in Japan. However, a representative of Dylan's bookers said Dylan had been blocked by the Chinese government, making a continuation of the Asia tour unworkable. "China's Ministry of Culture did not give us permission to stage concerts in Beijing and Shanghai, so we had no alternative [but] to scrap plans for a South East Asian tour," Jeffrey Wu, the head of operations for Taiwan-based Brokers Brothers Herald, told the South China Morning Post. Wu said that the opportunity to perform in China was "the main attraction" for Dylan. "When that fell through, everything else was called off," Wu said. The singer's next scheduled tour date is May 29 in Athens. 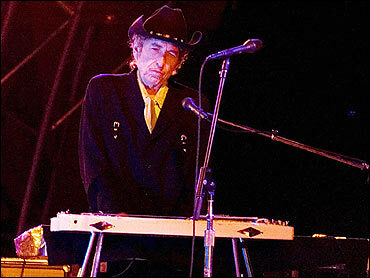 Wu told the Telegraph that Chinese authorities are increasingly wary about allowing performers who might prove embarrassing - especially one with the counterculture reputation of Dylan. Two years ago the Icelandic singer Bjork angered authorities by shouting out "Tibet! Tibet!" at the end of a performance in Shanghai. The Culture Ministry said Bjork's outburst "broke Chinese law and hurt Chinese people's feelings."